Don't let April showers rain on your parade. Pop the collar on one of these 14 eco-friendly wet-weather toppers and let your cares wash away—not one lick of PVC, Gore-tex, or hinky chemical treatments, necessary. Above, Splendid's reversible yellow slicker ($198), made in the U.S. of A. from 100 percent recycled polyester. Stutterheim’s unisex raincoat isn’t just a classic Swedish design, it’s also handmade in one of the nation’s few remaining textile factories. Coupled with meticulously sealed seams to prevent any leaks, the rubberized fabric is your best defense against the stormiest weather. Clad in waxed polyester and lined with cotton flannel, American Apparel’s domestically constructed rain parka offers thigh-length coverage, a matching nylon zipper, eight button closures, and six cord locks for extra security. Terra New York’s designer raincoats aren’t just PVC-free, they’re also made from solvent-free and biodegradable thermoplastic polyurethane, which breaks down in a landfill after 15 years of nonuse. The midnight-blue Tribeca trench includes a storm flap, mesh vents for breathability, and heat-sealed seams to keep you bone dry. Cleanse your aura with Karma’s recycled-polyester anorak, which features a ruched pillow collar, a contrasting two-way zipper, and ruffles on each cuff. Made in Canada, the jacket also includes bungee drawcords at the waist and near the hem for adjusting your fit and silhouette on the fly. Triple your protection with Norwegian Rain’s foul-weather garments. 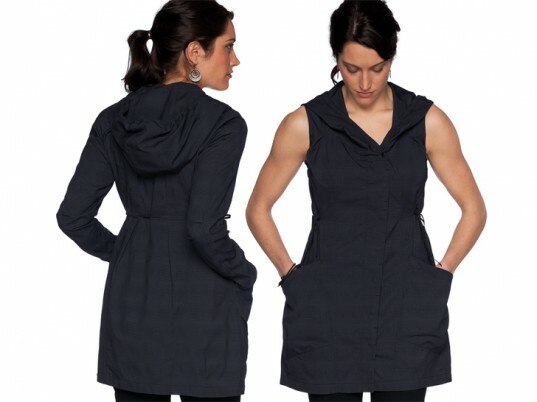 Each single-breasted topper consists of an agua-resistant outer and inner shell made of 100 percent recycled fibers, along with a breathable, heat-sealed membrane that keeps droplets from seeping through the seams. Pockets abound in Christopher Raeburn’s mid-length parka, which the British designer cobbled together from deadstock polyethylene—the same material Tyvek is made of. Let the heavens do their worst: The Arborist trench coat by Patagonia holds its own with a recycled polyester soft-shell exterior, a lined hood with a double-snap closure, a two-way front zipper, a detachable storm flap, welted hand-warmer pockets, and side-seam ties for wrapping around the front or back. Nau’s recycled-polyester Chrysalis dress handles the fickle elements with aplomb: The sleeves can be unzipped to transform the coverall into a vest, while collar-cinching drawstrings provide adjustable shielding for your neck and decolletage. 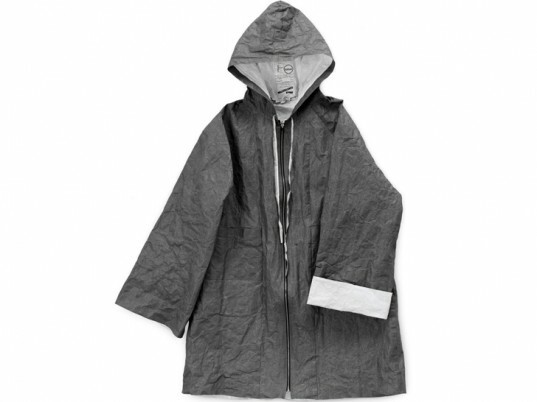 Made in NYC’s Garment District from surplus and post-industrial Tyvek, Mau’s unisex anorak combines the lightweight crispness of paper with the near-indestructibility of high-density polyethylene. The drawstring-waisted hoodie is even recyclable. Return your unwanted Tyvek garb, along with your stash of Tyvek envelopes, to designer Marian Schoettle and she’ll either reuse your largesse or forward it to DuPont for recycling. A dramatic ruffled collar, a double-breasted closure, and waist-cinching belt define Green With Envy’s chartreuse trench coat, which uawa a blend of cotton and recycled polyester to deflect downpours. Made in the United States, the all-season raincoat by Filson is lightweight enough for a mid-summer sprinkle yet roomy enough to pad with one of the brand’s zip-in vest liners. 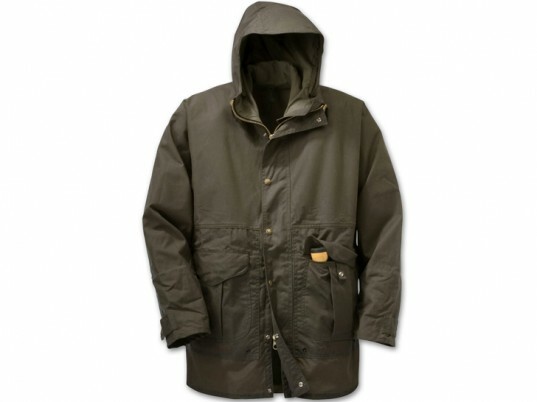 Finished with oil for water resistance, the jacket also includes a snap-closure storm flap, built-in hand-warmers, and expandable cargo pockets. A modern take on ye olde anorak, Organic by John Patrick’s recycled-nylon jacket offers military-inspired details like button cuffs and epaulettes, plus a drawstring hood to keep your noggin dry. 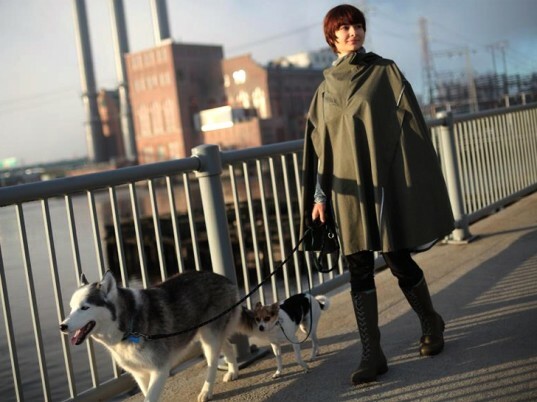 Designed by the Providence-based company that bears the same name, Cleverhood is a high-performance rain cape manufactured in the Northeast from waterproof yet breathable seam-sealed microfiber. Urban cyclists will appreciate the details, from the 3M reflective stripes to the interior finger loops for rainy-day peddling. Cool Coats! 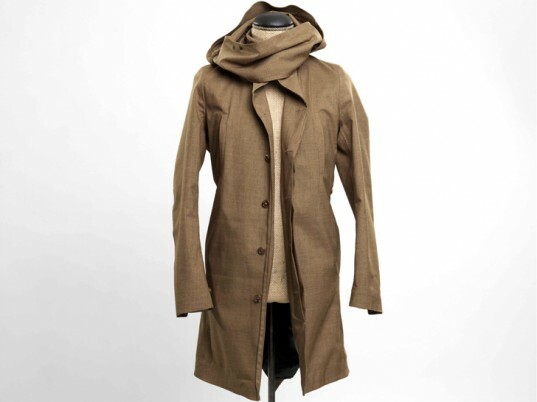 would have loved to have seen the beautiful Beeswax coated /Organic Cotton rainwear by Raffauf included here! www.raffauf.com - thats what I'm be rocking in the rain this Spring (well maybe some Chris raeburn too! )Thanks Ecouterre! Stutterheim's unisex raincoat isn't just a classic Swedish design, it's also handmade in one of the nation's few remaining textile factories. Coupled with meticulously sealed seams to prevent any leaks, the rubberized fabric is your best defense against the stormiest weather. 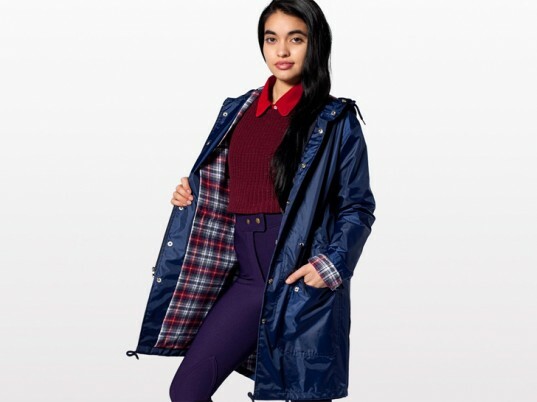 Clad in waxed polyester and lined with cotton flannel, American Apparel's domestically constructed rain parka offers thigh-length coverage, a matching nylon zipper, eight button closures, and six cord locks for extra security. 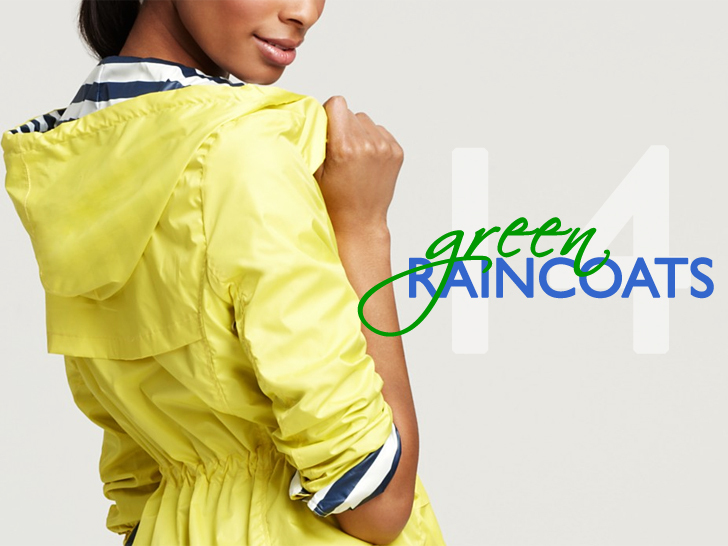 Terra New York's designer raincoats aren't just PVC-free, they're also made from solvent-free and biodegradable thermoplastic polyurethane, which breaks down in a landfill after 15 years of nonuse. 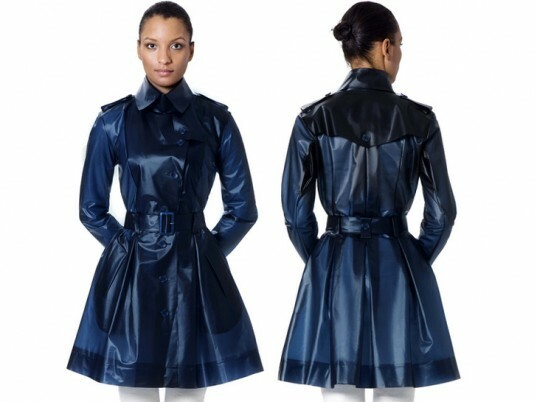 The midnight-blue Tribeca trench includes a storm flap, mesh vents for breathability, and heat-sealed seams to keep you bone dry. Cleanse your aura with Karma's recycled-polyester anorak, which features a ruched pillow collar, a contrasting two-way zipper, and ruffles on each cuff. Made in Canada, the jacket also includes bungee drawcords at the waist and near the hem for adjusting your fit and silhouette on the fly. 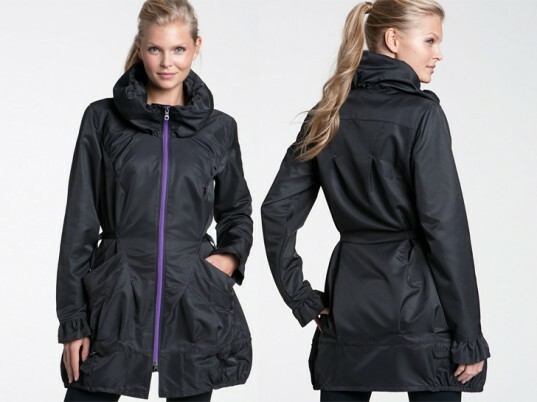 Triple your protection with Norwegian Rain's foul-weather garments. Each single-breasted topper consists of an agua-resistant outer and inner shell made of 100 percent recycled fibers, along with a breathable, heat-sealed membrane that keeps droplets from seeping through the seams. Pockets abound in Christopher Raeburn's mid-length parka, which the British designer cobbled together from deadstock polyethylene—the same material Tyvek is made of. Nau's recycled-polyester Chrysalis dress handles the fickle elements with aplomb: The sleeves can be unzipped to transform the coverall into a vest, while collar-cinching drawstrings provide adjustable shielding for your neck and decolletage. Made in NYC's Garment District from surplus and post-industrial Tyvek, Mau's unisex anorak combines the lightweight crispness of paper with the near-indestructibility of high-density polyethylene. The drawstring-waisted hoodie is even recyclable. 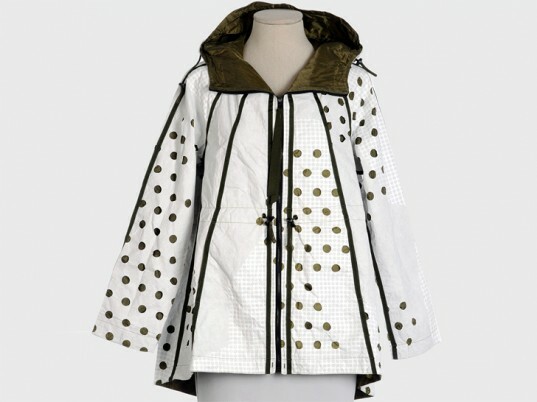 Return your unwanted Tyvek garb, along with your stash of Tyvek envelopes, to designer Marian Schoettle and she'll either reuse your largesse or forward it to DuPont for recycling. 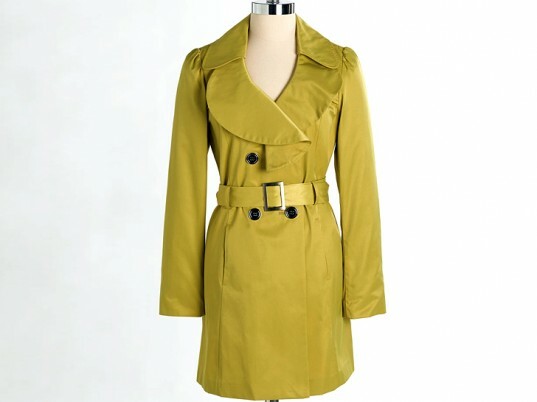 A dramatic ruffled collar, a double-breasted closure, and waist-cinching belt define Green With Envy's chartreuse trench coat, which uawa a blend of cotton and recycled polyester to deflect downpours. Made in the United States, the all-season raincoat by Filson is lightweight enough for a mid-summer sprinkle yet roomy enough to pad with one of the brand's zip-in vest liners. 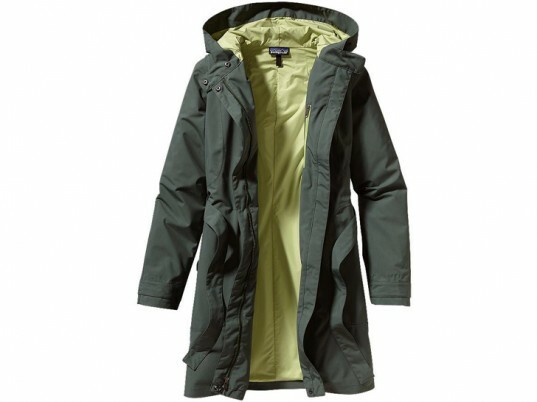 Finished with oil for water resistance, the jacket also includes a snap-closure storm flap, built-in hand-warmers, and expandable cargo pockets. 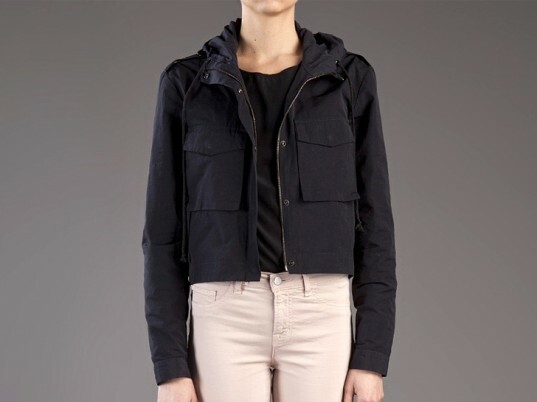 A modern take on ye olde anorak, Organic by John Patrick's recycled-nylon jacket offers military-inspired details like button cuffs and epaulettes, plus a drawstring hood to keep your noggin dry.